Mera (/ˈmɪərə/) is a fictional character appearing in American comic books published by DC Comics. Created by Jack Miller and Nick Cardy, the character first appeared in Aquaman #11 (September 1963) as a queen of the sea. Textless cover of Mera: Queen of Atlantis trade paperback (December 2018). Originally portrayed as a supporting character to her husband, the superhero Aquaman, modern writers have traditionally emphasised Mera's own superhuman physical strength and magical power to control water, portraying her as a powerful superhero in her own right. In recent years, Mera has even featured as a member of DC Comics' flagship superhero team, the Justice League. Mera's storylines have also portrayed mental breakdown faced with crippling loss and explored her attempts at coping with lasting anger and rage. In the feature films of the DC Extended Universe, actress Amber Heard portrayed Mera in Justice League, and reprised the role in Aquaman. Mera's Silver Age debut in Aquaman #11 (September 1963) set her place of origin as the mysterious "Dimension Aqua". However, during the 2011 "Brightest Day" storyline, Dimension Aqua was revealed to be the extradimensional penal colony known formally as Xebel, a place of exile for an ancient faction of Atlantean people, banished along with their descendants after one of the many civil wars of the submerged Atlantis. Mera is the former Queen of Dimension Aqua (Xebel), Queen of Atlantis, and wife of DC Comics superhero Aquaman. Mera also has a twin sister named Hila. In her first chronological appearance, Mera is shown to be fleeing the criminal Leron, who seized control of her kingdom, when she arrives on Earth and meets Aquaman and Aqualad, who vow to help her. Leron captures them, imprisoning Aquaman and Mera in Dimension Aqua. Aided by the water spirit known as Quisp, Aquaman manages to free Mera and defeats Leron. Mera abdicates the throne of Xebel to Queen V'lana, and returns to Atlantis to marry Aquaman. Soon after, they had a son named Arthur Curry, Jr., also known as Aquababy. A few years later, Black Manta kidnapped Aquababy and trapped him inside a translucent tank designed to suffocate him. Vulko sends Mera, desperate to save her son, on an ambitious crusade to her homeworld to find the scientist Xebel, who has the components for a special healing device that could save her son. When she arrives, she discovers that her kingdom has been taken over by the traitorous Leron, who has taken Sebel hostage, casting him and the artifacts into the Great Pit. Mera braves the pit and defeats Leron and his elemental monsters in order to retrieve the device. Sadly, she returns to Atlantis too late, finding her son dead. Although their son's death created a rift between Aquaman and Mera, they tried relocating to a flooded city on the East Coast to start a new life together. It was during this time that Aquaman left to reform the Justice League in Detroit. Becoming more unstable with grief, Mera was committed to an asylum in Atlantis. Shortly afterwards an alien force of sentient giant jellyfish took control of the city. During Aquaman's battle to free them, Mera escapes and savagely attacks him, blaming his "weak genes" for their son's death. While defending himself, he accidentally pushes her onto an upturned piece of metal, impaling her. Believing her dead, he has her placed inside a coffin and taken to the royal palace. However, she survived, due to her alien physiology. Rising from her coffin, she bitterly reminds Aquaman how little he really knew of her. No longer seeing any reason to remain on Earth, Mera leaves Atlantis and returns to Dimension Aqua. During Peter David's Aquaman run in the 1990s, Mera is revealed to be in the hellish dimension called the Netherworld, where she is brainwashed by Thanatos, an old enemy of her husband. Time passes differently in the Netherworld and she has apparently had a second son whom she refers to as only "AJ". AJ appears to be about 8–10 years old and it is not known if his father is Aquaman or Thanatos. Eventually, Mera and AJ break free of Thanatos' control, but find that they cannot stay on Earth due to AJ's accelerated aging. Mera and AJ again leave Earth for parts unknown. When next shown later in the series, Mera and AJ are on Oceanid, a waterworld that is being exploited by aliens for its resources. Mera and AJ team up with Aquaman to defeat the aliens and Mera chooses to stay with her former husband in Atlantis, while AJ remains behind on Oceanid to act as its protector and champion, assuming the role of Aquaman. Mera and Arthur eventually reconcile, living in Atlantis and continuing to have adventures together, including a trip to Skartaris, where they team up with Travis Morgan, The Warlord. They appear to form a true royal family along with Tempest (Garth of Shayeris) and his wife, Dolphin (Aquaman's former lover). Mera participates in the delivery of Garth and Dolphin's son, Cerdian, during this peaceful time. Unfortunately, the Aqua-family's happiness is cut short due to the events depicted in DC's "Obsidian Age", Infinite Crisis, and "One Year Later" storylines. Following these events, Mera is shown leading a rebel faction in the rebuilding of Atlantis, which was destroyed by the Spectre in Infinite Crisis. Mera appears in the Aquaman: Sword of Atlantis series during which Aquaman (having been transformed into the Dweller of the Depths during DC's World War III mini-series) appears to perish. Members of the JLA visit Atlantis to give their condolences and Mera is not referenced in DC comics until the "Prelude to Blackest Night" story in Titans #15, where it is revealed that she is in mourning for Arthur. This story also reveals that Dolphin and Cerdian died during the destruction of Atlantis. Red Lantern Mera attacking Wonder Woman. Art by Nicola Scott. In the "Blackest Night" storyline, at the request of Tempest, Mera reluctantly allows Aquaman's remains to be returned to Atlantis. Before they can do so, they are attacked by Aquaman, Tula, and Dolphin who have been reanimated as Black Lanterns. Mera and Tempest battle them, but are overwhelmed by their power. Tempest is killed by Tula and summarily transformed into a Black Lantern as well. An angry Mera manages to escape and flees to the Hall of Justice. She sends out a distress signal, and Firestorm (Jason and Gehenna) come to her aid. She reveals that she was able to evade the Black Lanterns by keeping her emotions in check. The Black Lantern Justice League attacks the group. The Atom helps the heroes escape via a phone line. The Flash tells Atom and Mera that they are the Justice League now. Atom and Mera meet up with the Justice Society who are battling Black Lanterns. The reanimated Jean Loring uses Atom's own technology to shrink Mera, Atom, and herself. They fall into the freshly killed Damage's ring. As Mera and Atom battle Loring inside the black ring, Loring reveals Nekron's plan. Deadman witnesses their battle and plans to rescue Mera and Atom from Loring. Deadman saves Mera and Atom by briefly possessing Loring, allowing Mera and Atom to escape and join the heroes against Nekron and his army. Fuming after battling and being nearly killed by a ruthlessly savage Black Lantern-powered Wonder Woman, an angry Mera is chosen as a deputy officer of the Red Lantern Corps to be more effective against Nekron's forces. During the battle, Mera is approached once again by Aquaman, who now has the reanimated corpse of their child. Aquaman attempts to use their son against her, but Mera states, "I never wanted children," and destroys the Black Lantern version of Arthur, Jr. The power of her anger even impresses Atrocitus. She then shows a desire to hunt down Aquaman and destroy him. Mera then encounters Wonder Woman, who had been transformed into a Star Sapphire by a duplicate of Carol Ferris' ring, and attacks her. During the fight, their two rings interface with each other, the violet light giving Mera some measure of control over her new-found savagery and provides Wonder Woman with an insight into the reasons for Mera's rage. Following Nekron's destruction, Aquaman is restored to life by the white light. The sight of Arthur alive calms Mera down, breaking her connection to the red ring and causing her to go into cardiac arrest. Carol and Saint Walker use their combined lights to restore her to life, and she tearfully reunites with Aquaman. In the 2009-2010 "Brightest Day" storyline, Mera's origin is revisited with new revelations, expanding upon some elements and writing off others as deceptions and lies fed to Aquaman by Mera herself. Instead of being the Queen of Dimension Aqua, Mera is now the older princess of Xebel, a forgotten extradimensional penal colony for an ancient group of separatist Atlanteans, banished behind a sealed portal in the Bermuda Triangle. Trained since birth, along with her younger sister Siren, Mera was sent by the King of Xebel, who was unable to send more than one soldier at a time through a small fissure in spacetime to the main universe. They were to confront the current King of Atlantis and kill him in retaliation for the exile of their common people. However, the plan backfired when Mera fell truly in love with Arthur, deliberately choosing to keep claiming her cover story as her real past to avoid frictions with him. However, on several occasions, like Aquababy's death, Mera's deep-seated hatred for Atlantis and its royal family was re-ignited, sparking the bouts of apparent insanity and angry lashing at her husband for his "weakness". It is also hinted that Black Manta had a long-lasting feud with Xebel's people; despite Aquaman believing for years to have been the cause of Aquababy's death, Mera still thinks that her son was killed to get back at her birth family. During one of the several attempts to escape en masse from the Bermuda Triangle portal, the people of Xebel are ordered to capture and experiment on several land-dwellers, including the future Black Manta. During these grueling experiments a young hybrid, son of Black Manta and an unnamed woman, was born. While Mera's father wanted to experiment on the child, using his hybrid nature to escape from the barrier, Mera took pity on little Kaldur'ahm and, adding a new reason of friction between herself and her birth family, kidnapped Kaldur'ahm to give him to a caring family on the surface. Mera didn't meet Kaldur'ahm again for many years, until a now adolescent Kaldur'ahm was discovered by the Xebel army, forcing Mera to return in his aid. Following the "Blackest Night" storyline, Aquaman ponders the mystery of his resurrection, disturbed by the recent events, despite Mera's attempts to comfort him. While cleaning up an oil spill, they are attacked by soldiers from Mera's homeworld led by Siren, who bears a striking resemblance to Mera, who reveals that she was sent to kill him, proceeding to confess her real origins to him. She also hints that, despite the long-lasting exile of her people, Xebel's soldiers had been enemies of Black Manta himself from a distant time, even preceding the first public appearance of Aquaman, and states that, despite Mera's original mission being a "solo" one, Siren is now backed by the entire "Death Squad", elite Xebel soldiers at the orders of the acting princess. Mera reveals that Siren is her younger sister. After being shown a vision by the Entity, Aquaman tells Mera that he must track down a teenaged boy with an eel tattoo. Upon hearing Arthur's description of the boy's appearance, a shocked Mera says she knows who the boy is, prompting Aquaman's search for the boy himself. The boy, Jackson Hyde, eventually becomes the newest person to bear the name Aqualad. In The New 52, the 2011 relaunch and retcon of DC Comics' entire superhero line, a greatly disillusioned Aquaman, distressed by the rejection faced from his fellow Atlanteans and his poor standing as a superhero, often ridiculed because of his shortcomings and less than glamorous superpowers, decides to return to Amnesty Bay. Mera follows him, helping her husband try to find a new place in the world, despite being saddled from the same ill reputation as the almost useless "Aquawoman", and mistakenly believed to be a mermaid by the general public. Mera has difficulty adjusting to society on the outside world and severe problems controlling her anger. She also aids Arthur and The Others in trying to uncover the mystery behind the sinking of Atlantis and fights against Black Manta, who tries to obtain the ancient artifacts of Atlantis. It is revealed that Mera had been sent by her father, the King of Xebel to assassinate the King of Atlantis. However, after being impressed by Arthur's nobility, and after uncovering a secret message from her late mother encouraging her to find her own path away from Xebel's restrictive society, she falls in love with and marries him. Following the "Throne of Atlantis" storyline, Mera is approached by the police force to arrest her again for violent assault following an outburst in town. Mera and the police officers discuss civic virtues, and she is confronted by Officer Watson, who knew Aquaman when they were at school. Watson reasons with Mera and tells her to stop being hostile. She also tells her that she needs to respect the law and society on the surface. As Mera concedes, she and the police officers are attacked with the winter storm by the Dead King who demands her to lead him to the Xebel location. The Dead King drags Mera to the Bermuda Triangle and opens the Xebel barrier, but Mera manages to escape from the Dead King. When Mera returns to her previous home of Xebel to warn them, it is revealed that she was betrothed to Nereus, who is the current king of Xebel. He asks Mera "Where the hell have you been?" Nereus is angered when he discovers Mera is on the side of Atlantis and Aquaman's lover. Mera and Nereus are frozen in ice by the Dead King. Aquaman arrives to free Mera and confronts the Dead King, who turns out to be the first king of Atlantis who plans to rule the Seven Seas once more. During the fight, Mera frees Nereus and Xebel soldiers to help Aquaman against the Dead King, but Nereus and Xebel soldiers bow to the Dead King, claiming that he is the true king of the Seven Seas. When Mera and Aquaman escape from Xebel soldiers and arrive at Atlantis, it is under attack by Scavenger and his men. Aquaman tells Atlantean to fall back using his physical force ability to summon the Kraken that attacked Scavenger's men. However, Aquaman is unconscious when the Dead King and Xebel soldiers arrive. Aquaman revives with Vulko on the surface world, but Vulko reveals to him that he has been in a coma for six months. Aquaman asks what happened to Mera after six months; Vulko said he saw Mera was facing the Dead King. Later, Mera is imprisoned by the Dead King and Xebel soldiers are controlling Atlantis. Mera refuses to marry Nereus and warns that she will kill him if she is released. Aquaman arrives to free Mera and the Atlanteans, and they battle the Dead King and Xebel soldiers. When the Dead King is destroyed, Nereus and Xebel soldiers retreat, and Mera reunites with Aquaman and decides to remain in Atlantis. Mera is often left in command of Atlantis while Arthur confronts external threats or attends to his superheroic duties. Initially unpopular, she wins the support of Atlantis' Council of Elders and the respect of the people for her courage and competent handling of domestic issues. She also accompanies Arthur on his quest to find his mother, Atlanna, who is revealed to have faked her death. When buildings and war machines from Thule, an alternate version of Atlantis in a parallel reality, Arthur leaves Mera in charge of Atlantis while he goes to resolve the crisis. Arthur learns that, as well as the invasion forces, refugees are also crossing over from Thule. Arthur chooses to allow the incursions to continue in order to rescue as many innocents as possible, even though the incursions are poisoning the seas. This leads to Mera seemingly turning on him and declaring him an enemy of the state. In fact, the "Mera" in charge of Atlantis is revealed to be her sister Siren, who has imprisoned the real Mera. Mera is able to free herself and easily overpower Siren as Arthur is attempting to rescue her. The pair reunite and join the Justice League in rescuing as many refugees from Thule as possible, before closing the connection between the two worlds. The events of Thule's invasion inspire Arthur to open formal diplomatic relations with the surface. He constructs an Atlantean embassy in his hometown of Amnesty Bay, Massachusetts, and names Mera the ambassador. She proves highly adept in the role, becoming a media darling and a popular liaison with law enforcement. Mera's character is largely unchanged following the DC Rebirth reboot. However, her personal history is altered. Rather than being Aquaman's wife, she is now his fiancé, but is still Atlantis' ambassador to the surface. Post-Rebirth, Xebel is no longer concealed behind a magical barrier and is accessible from Atlantis. When she was a child, Mera's father took her to view Atlantis from a distance. He told her to see Atlantis for what it could be, not what it was, however, all the young princess felt was anger. In order to marry Arthur, Mera is required to spend months in seclusion with the Widowhood, an order of priestesses whose husbands and sons died in service to Atlantis. The widows attempt to divine Mera's future, and forsee that she will be a great queen, yet also that she will doom Atlantis and the surface as the "Fatal Queen" when Arthur dies shortly into his reign and Mera is driven mad with anguish. Mera stars in a limited series that began in February 2018 and concluded in July 2018 in which she defeats Ocean Master and becomes Queen of Atlantis. During the Drowned Earth event, a trio of alien gods named the Triumvirate who were betrayed and imprisoned by the Atlantean wizard Arion centuries ago attack the Earth with dark waters that turn anyone they touch into mutant fish creatures under the Triumvirate's control. The Triumivrate are aided by Lex Luthor's Legion of Doom, including Arthur's nemesis, Black Manta. Mera frees Ocean Master from his dungeon, and the two recover the centerpiece of Arion's crown known as the Clarion from a secret chamber. Orm tells Mera of the Tear of Extinction, the weapon Arion used against the alien gods, before being taken by the invaders. With the aid of Superman and the Flash, she heads to Arion's secret tomb, and recovers the Tear, creating a sword of water which can harm the alien gods. The trio are attacked by a wave of mind controlled superheroes and villains, but rescued by Aquaman and Wonder Woman. Arthur and Mera reunite, and Arthur explains that with the Tear and Poseidon's Trident, they could kill the Triumivrate, but he wishes to try another way. As the group attacks the Triumivrates flagship, Mera realises that the Clarion has been contaminated with darkness, but that Arthur can restore it to the symbol of hope it was meant to be. Arthur successfully restores the Clarion, which Mera is able to use to psychically reach the Triumvirate, causing them to end hostilities. However, Black Manta unleashes an alien sea monster known as the Death Kraken upon the Earth, which he is unable to control. Arthur successfully stops the Kraken, but appears to die as he does so. Mera takes his place on the Justice League as Aquawoman. Mera has the unique ability to form "hard water" objects, as well as super strength and powers related to her adaptation to living under water. She has been shown to be powerful enough to control, albeit briefly, huge amounts of water, enough to pull an entire army out to sea. Due to her intended role as an infiltrator and a killer, Mera received extensive training in Xebel, becoming a formidable opponent on her own. Earlier stories placed some limits on Mera's abilities, such as susceptibility to lead. However, her main weakness was her struggle with mental insanity, made more apparent after A.J. 's death. Once suspected to be the lingering effect of the psychotic breakdown suffered for the loss of her only son, with Mera blaming Arthur for his shortcomings, it has later been revealed to be the byproduct of the torn loyalties between her duties towards Xebel and her love for Arthur, and the full knowledge that Black Manta actually hated her (for hiding Jackson from him) more than Aquaman himself, and thus having to hide her responsibilities in the events. Mera was ranked 81st in Comics Buyer's Guide's "100 Sexiest Women in Comics" list. In the alternate timeline of the 2011 "Flashpoint" storyline, Mera is the Queen of Atlantis and killed by the Amazons at some point. Her death prompted Aquaman to cause Western Europe to sink into the sea, hoping to destroy New Themyscira as well. Mera's death was ordered by Wonder Woman. In a flashback, Mera is shown to attack the Queen of New Themyscira, which at that point was Diana (Wonder Woman), but she was eventually beheaded by Wonder Woman. In Injustice: Gods Among Us, comic book prequel to the video game of the same name, Mera plays a minor role, often appearing and asking her husband Aquaman about Atlantis and their people's safety due to his forced alignment with Superman's One-Earth regime. Mera appears in the 1960s The Superman/Aquaman Hour of Adventure television series, voiced by Diane Maddox. The opening narration describes her as "an Atlantean woman". Mera appears in the 2001 Justice League animated series, voiced by Kristin Bauer. Her origins are not elaborated on, nor is she shown to have the ability to forge structures from hard water as in the comics, so she is presumably an Atlantean. She appears in "The Enemy Below", "The Terror Beyond", and "Hereafter" (attending Superman's funeral with her husband). Bruce Timm's design for Mera is inspired by her Silver Age comics look, but adds elegant touches of regality such as gold jewelry and transparent green draped fabric, as well as a midriff-baring halter. Mera is featured in Batman: The Brave and the Bold, voiced by Sirena Irwin. She made a brief cameo as part of Atlantis' royal family in the episode "Evil Under the Sea", where she is seated next to Aquaman and Orm (Ocean Master). Mera also appears in "Aquaman's Outrageous Adventure" where she demands her husband take her and Arthur Jr. on a land-based vacation. Mera has greater-than-human strength when helping to fight the Penguin's henchmen, but she is not shown to have the ability to forge structures from hard water as in the comics. Actress Elena Satine portrays Mera in an episode of the final season of Smallville. In this incarnation, she once again was Aquaman's wife. Arthur and Mera discovered that General Slade Wilson was building prisons for superheroes following the passing of the Vigilante Registration Act and destroyed one of them. Clark Kent went to confront Arthur about this, but Mera, deeming him a threat, knocked him aside with her hydrokinesis. As Clark and Arthur went off to investigate Slade's operation further (resulting in Arthur being kidnapped), Mera was confronted by Lois Lane, who was trying to help Clark. At first, Mera deemed Lois a lesser being compared to herself, Arthur, Oliver Queen and Clark, until Lois managed to help them save Arthur with information on the prisons. Mera managed to rescue Oliver and Arthur. Later, before leaving town with Arthur, Mera apologized to Lois and admitted that she is a worthy partner of equal standing for someone like Clark. Mera appears in the Young Justice episode "Downtime", voiced by Kath Soucie. She is Aquaman's wife and queen of Atlantis. She is also shown to be an instructor at the Conservatory of Sorcery. During Black Manta's assault on the palace, she is shown to be able to forge animated hard water constructs. She also has skin markings similar to Aqualad's, though hers take the form of the tentacles of an octopus and are only visible when using her full power. It is also revealed that she is pregnant with her and Aquaman's child. She reappears in Young Justice: Outsiders with her son Arthur Jr.
Mera appears in DC Super Hero Girls, voiced by Erica Lindbeck. Amber Heard as Mera in the 2017 film, Justice League. Mera made her live-action film debut in Zack Snyder's Justice League, portrayed by Amber Heard. Heard reprised the role in James Wan's Aquaman. Mera is depicted as a warrior, a sorceress, and the daughter of a king. In Justice League, Mera is shown to be in charge of protecting the Atlantean Mother Box. When Steppenwolf arrives on Earth, he heads to an Atlantean outpost to recover the box. Mera tries to holds him off but in vain. Aquaman intervenes, and in the ensuing fight, Steppenwolf fends them off and escapes via a Boom Tube. After he escapes, Mera encourages Aquaman to pursue him and recover the box, prompting him to join the Justice League. In Aquaman, she starts off as the betrothed to Orm, being she is the Princess of neighboring Xebel. At the behest of Vulko she seeks out Arthur Curry to convince him to take his rightful place on the throne. Then she helps him escape his half-brother during his challenge for the throne when things go bad. After hiding from the Atlantis guard inside a whale the two head to the Sahara as they are searching for Atlan's Trident. The next clue leads them to Sicily, Italy where Mera experiences the Surface world for the first time. Black Manta and the Atlantis guard attack as Arthur and Mera find the second clue. Mera unknowing steals a boat (she thinks that they are for public use). The Trench attack, but Mera and Arthur are saved by his mother, who had been presumed dead. When they arrive back at Atlantis to stop a war against the surface she kisses Arthur for the first time and stands by his side as all recognize Arthur as king. Mera briefly appears in the animated film Justice League: The Flashpoint Paradox. In a flashback scene of the distorted timeline, she is shown to be murdered during a confrontation with Wonder Woman, who Mera finds having a secret affair with Aquaman, which serves as his primary motivation for sinking most of Europe and waging war against the Amazons. It is believed that Aquaman sunk Themyscira and prompted the Amazons to attack Britain to claim it as New Themyscira, which Aquaman also attempts to sink, but cannot because it is protected by a magic barrier. Mera appears as one of the main characters in the animated film Justice League: Throne of Atlantis, voiced by Sumalee Montano. She is an Atlantean and queen Atlanna's royal guard. 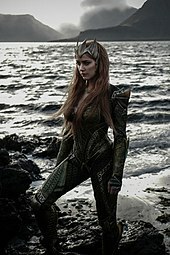 In the film, she plays a crucial role in finding and saving Arthur Curry; Mera becomes his love interest in the end. Mera appears in Lego DC Comics Super Heroes: Aquaman: Rage of Atlantis, voiced by Susan Eisenberg. Mera makes a non-speaking cameo appearance in The Death of Superman, she alongside Aquaman and several Atlantean troops investigate the oceans to learn what had killed the Atlanteans who came to intercept a submarine, whose occupants were also killed of Doomsday's attacks. Mera is a major character in DC Super Hero Girls: Legends of Atlantis, voiced by Erica Lindbeck. Mera appears via downloadable content as a playable character in Lego Batman 3: Beyond Gotham. Mera is mentioned in Injustice 2 by Aquaman and Harley Quinn, the latter of whom asks whether he kisses like a fish too, to which the former replies that only Mera knows. Mera appears as a playable character in DC Unchained. Mera appears in Lego DC Super-Villains as part of the Aquaman DLC. Mera appears starting in the fourth season of the animated web series DC Super Hero Girls, voiced by Erica Lindbeck. ^ "Amber Heard". Comic Book Resources. ^ Begley, Chris (2017-05-18). "First look at Amber Heard's new Mera costume for 'Aquaman'". Batman News. Retrieved 2017-05-19. ^ a b c d e Brightest Day #6 (July 2010). DC Comics. ^ The DC Comics Encyclopedia. Dorling Kindersley Limited. 2004. p. 200. ISBN 0-7566-0592-X. ^ Aquaman vol. 3 #5 (October 1989). DC Comics. ^ Blackest Night #3 (September 2009). DC Comics. ^ Blackest Night #4 (October 2009). DC Comics. ^ Green Lantern vol. 4 #50 (January 2010). DC Comics. ^ Blackest Night #8 (March 2010). DC Comics. ^ Brightest Day #16 (December 2010). DC Comics. ^ Brightest Day #0 (April 2010). DC Comics. ^ Brightest Day #5 (July 2010). DC Comics. ^ Brightest Day #9 (September 2010). DC Comics. ^ Brightest Day #10 (September 2010). DC Comics. ^ Aquaman vol. 7 #2 (October 2011). DC Comics. ^ Aquaman vol. 7 #8 (February 2012). DC Comics. ^ Aquaman vol. 7 #17 (February 2013). DC Comics. ^ Aquaman vol. 7 #18 (March 2013). DC Comics. ^ Aquaman vol. 5, #19 (May 2013). DC Comics. ^ Aquaman vol. 7 #21 (June 2013). DC Comics. ^ Aquaman vol. 7 #22 (July 2013). DC Comics. ^ Aquaman vol. 7 #23 (August 2013). DC Comics. ^ Aquaman vol. 7 #24 (October 2013). DC Comics. ^ Aquaman vol. 7 #25 (November 2013). DC Comics. ^ Frankenhoff, Brent (2011). Comics Buyer's Guide Presents: 100 Sexiest Women in Comics. Krause Publications. p. 52. ISBN 1-4402-2988-0. ^ Flashpoint: Emperor Aquaman #2 (July 2011). DC Comics. ^ Flashpoint: Wonder Woman and the Furies #2 (July 2011). DC Comics. ^ "Mera Makes Splash on 'Smallville'". Newsarama. October 5, 2010. Retrieved 2010-12-26. ^ "Aquaman Movie Lands Amber Heard as Mera". ComingSoon.net. CraveOnline. January 13, 2016. Retrieved January 13, 2016. ^ Kile, Meredith B. (March 17, 2016). "EXCLUSIVE: Amber Heard Confirms Her 'Aquaman' Role in 'Justice League', Dishes on 'Interesting' Mera Costume". ET Online. Mera on DC Database, an external wiki, a DC Comics wiki.